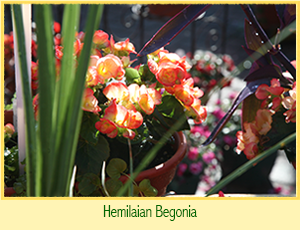 The shady spots in the garden can seem a little dark, but we have the color to brighten them up with a wide selection of begonia varieties: wax, hiemalis, tuberous, dragon & angel wing. 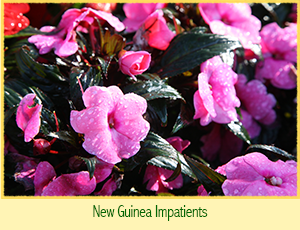 We have over twenty 20 colors of New Guinea Impatiens that thrive in the shade or part shade conditions and can bring fresh color into hosta gardens. There are tropical plants which work well in the shade or with indirect light, and can work nicely as an indoor plant display. Many of our shade loving plants find their way into our patio ready container creations. Both Mary and Kathy have a lot of shade in their own gardens and that increases their desire for the best options available for shade. Their passion for gardening helps fuel the selection of the best annuals for you at the Garden Center. We have many wonderful accents, such as Diamond Frost Euphorbia, Moneywort, Torenias and many more. Our Shade selections will surprise you. It is not just impatiens anymore.